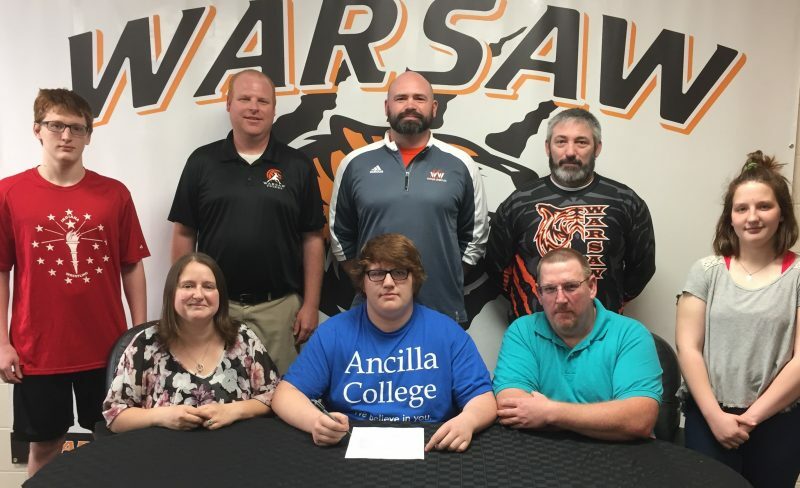 WARSAW – Warsaw Community High School senior Dillon Estepp has selected Ancilla College for his next official weigh in. Estepp, a letterman in both football and wrestling for the Tigers, will wrestle for Ancilla and coach Ryan Quinn, and the WCHS Athletics Scholar Athlete will study Criminal Justice. Not only did Estepp enjoy an outstanding season on the mat for the Tigers at heavyweight, the senior grappler also participated in football all years. A winner of the Tiger Pride award for Warsaw Wrestling this past season, Estepp has been a winner in the school and community, serving with groups assisting with the Soup Kitchen, Feed My Starving Children, Warsaw Flag Football League, and volunteering with the Warsaw Wrestling club. Ancilla competes in the NJCAA and the Michigan Community College Athletic Association.